During the past few years, research has shown evidence [how] past life has been preserved in impact glass here on Earth. A 2014 study led by scientist Peter Schultz of Brown University in Providence, Rhode Island, found organic molecules and plant matter entombed in glass formed by an impact that occurred millions of years ago in Argentina. Schultz suggested that similar processes might preserve signs of life on Mars, if they were present at the time of an impact. 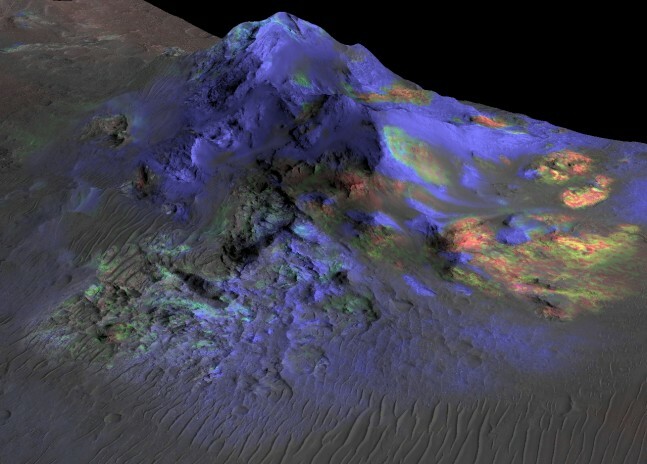 Once Mustard had the signal from the lab glass, he used an algorithm to pick out similar signals in data from MRO’s Compact Reconnaissance Imaging Spectrometer for Mars (CRISM ), for which he is the deputy principal investigator. “This significant new detection of impact glass illustrates how we can continue to learn from the ongoing observations by this long-lived mission,” said Richard Zurek, MRO project scientist at NASA’s Jet Propulsion Laboratory, Pasadena, California. The Johns Hopkins University Applied Physics Laboratory in Laurel, Maryland, provided and operates CRISM. JPL, a division of the California Institute of Technology in Pasadena, manages MRO for NASA’s Science Mission Directorate in Washington. Lockheed Martin Space Systems in Denver built the orbiter and supports its operations.